Fingerprints could be used to detect traces of drugs or explosives in one of the most significant improvements in the technology for years. Police now have the ability to analyse the traces of cannabis, cocaine and other drugs, or explosives, in a fingerprint itself. The new technique reveals, in extraordinary detail, the chemical compounds that make up the print and could also find medical uses, since tiny traces of chemicals at our fingertips could signal the presence of a disease or an illness. 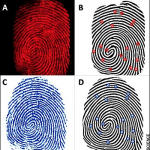 This method, Desorption Electrospray Ionization or DESI, can also be used directly on a fingerprint, right where it’s found, without the need to lift the print off and take it to a lab for analysis. The technique is developed bythe team of Dr Demian Ifa and Prof Graham Cooks at Purdue University in West Lafayette. It involves spraying a solvent onto a fingerprinted surface and then analysing the droplets that scatter off the print with a method called mass spectroscopy. 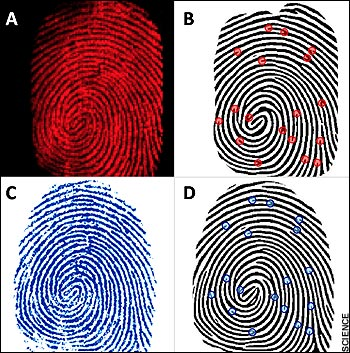 The technique provides a “chemical image” of the fingerprint with higher resolution than other techniques, and can analyse as little as a billionth of a gram of material. In this way, the researchers can detect minute traces of compounds – marked as dots on the print – that were on the fingertips of the person who left the print. The technique can pick up small amounts of drugs like cocaine or THC, the active ingredient from marijuana, as well as compounds from explosives. Besides detecting illegal substances, researchers may also find this technique useful for identifying metabolites or other compounds in fingertip secretions, whose presence may signal other processes happening inside the body. The image can also be analysed with standard fingerprint imaging software to try to identify that person and help distinguish overlapping prints. Because the distribution of compounds found in each fingerprint can be unique, we also can use this technology to pull one fingerprint out from beneath layers of other fingerprints. The team is also studying if it could be used as an alternative to blood and urine tests for athletes.